When the iron-rich spinach combines with the fibre rich chickpea then you get a bowlful of health. 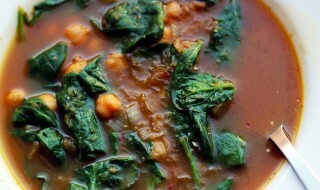 Try this satiating and tasty spinach chickpea soup now. 3/4 cups shredded spinach (palak). Heat the olive oil in a deep non-stick kadhai, add the garlic, green chillies and spring onion whites and sauté on a medium flame for a minute. Add the spinach and kabuli chana and sauté on a medium flame for another 2 minutes. Add the basic vegetable stock, salt, pepper, oregano and lemon juice, mix well and bring to boil.